These two pieces I snagged from Hand to Earth Ceramics were truly meant to be. 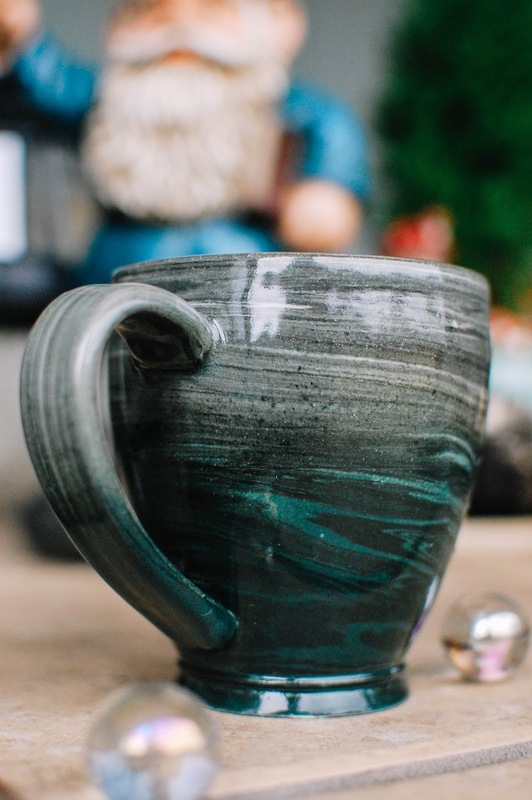 Deanna, who I featured before, creates some seriously creative and beautiful pottery pieces. Her use of color gradations, sgraffito and slip trailing all combine in natural themes to enchant the eyes and mind. I do have a whiskey tumbler that I use for tea, a goblet and mini planter in my collection which I blogged about here. I really wanted a coffee mug and another planter so I set my alarm when she announced her next restock. I picked up this coffee mug and a small bowl that I ended up using as a planter. Just look at the striations in this mug?! It is a dreamy galaxy of color and texture and layers. I love the deep teal shade with the grey hues. The mug is nice roomy, holding at least a full cup and a half of coffee comfortably. I like the sharp looking foot and that the walls of the mug are a nice thickness, not too thick, not too thin. 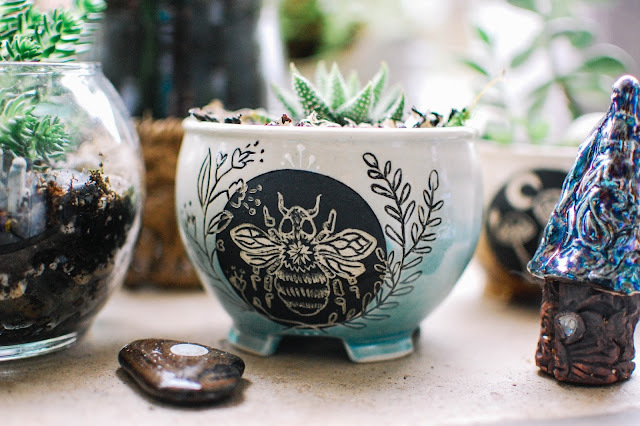 This small bee bowl is adorable. I love the wreath of flowers and plants and the light aqua and ivory combination. The sunburst on the thorax of the bee is very cool. 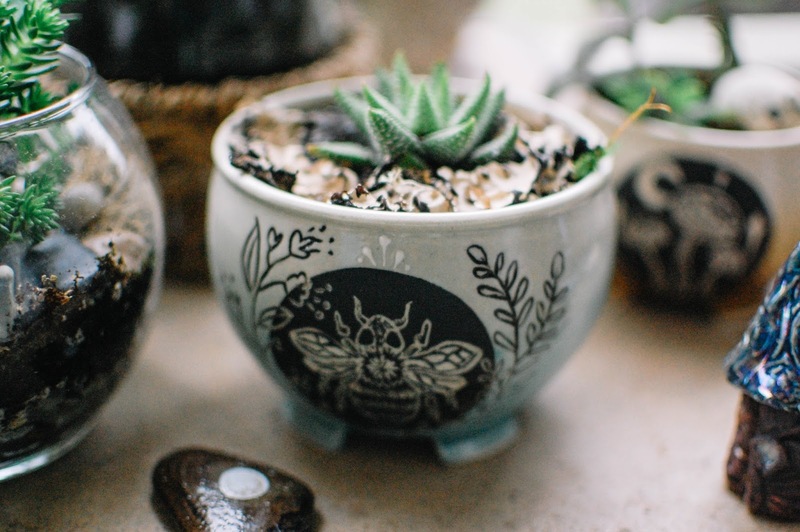 As it is a bowl, it doesn't have a drainage hole so I layered some rocks in the bottom for drainage and I will try not to over water this spiky succulent that I planted in here. These pieces hovered around $35 to $40 dollars each. I love them so much and will continue to try and add a couple more pieces. 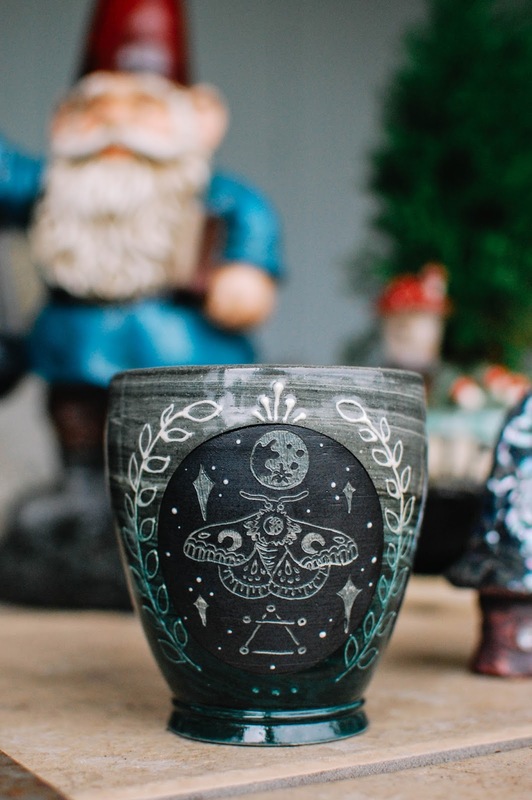 In particular I love her full moon artwork and would love to try for a planter in that. So far my plants are doing pretty well! I am shocked! My black thumb seems to be slowly turning green. I found my beloved rabbit's foot fern at Lowe's this past weekend so I will show y'all that soon. What is your favorite house plant? 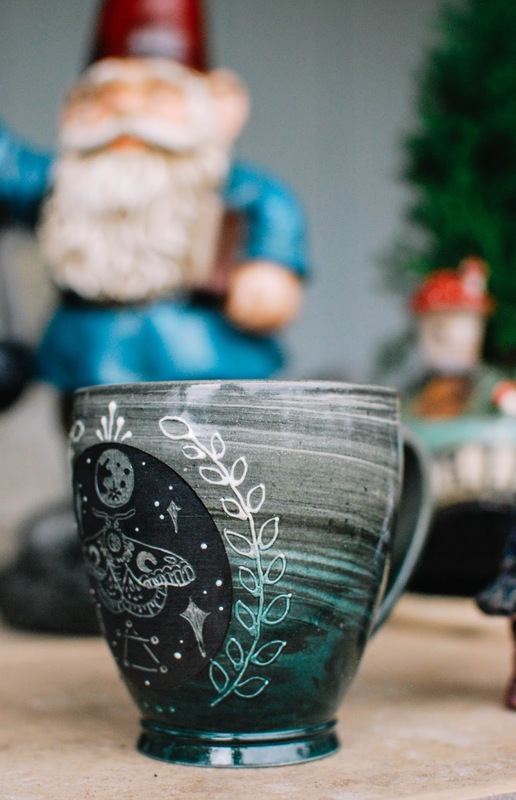 Do you have a favorite potter? The mug is nice but I *love* that bowl! We must chat about succulents sometime. I want some, but I know absolutely nothing about them. Does your cat bother them? The biggest reason I don't have more plants is because of the cats chewing on them. I don't want to have them chewing on something that's toxic to them. And Minion *will* chew any plant! Well maybe not a cactus with long spikes....hmm. Thanks! The bowl is pretty darn sweet. I am a huge fan of her insect sketches. You should see the detail on her full moons. I would be happy to talk plants! The majority of mine are outside on my patio but I did bring in four. Three in the kitchen and one on top of my bookshelf... oh! and one on my living room coffee table. So far she has not messed with them but it has only been about 2 days. I will find out today when she has been home all alone without Adam there. I think she tends to behave more when Adam is home working. I don't blame you about being leery with the plants around cats but I think the ones I have are all pet friendly. LOL!!! I do think he would be more careful around the cacti too. We have a few of those too. In fact, Savanna has one named Jeff in her bedroom (cactus with long spikes) and Tod has never messed with it. Just gorgeous. I am coveting these more than my "heirloom" mug! The last remaining bowl is tempting although it has less of the really detailed sgraffito. I've been on a no-buy lately and feel like it helps me reset the craving meter. The heirloom found a new home via eBay. :) The other For Strange Women perfume I got is Cardamom and Spruce, check it out if you decide to order again. The cardamom makes the spruce smell sprucier. <3. I just read your post about Candy Panda, I will check out the new line. I hope you got a nice amount for it. <3 I saw that Cardamom one you got! It sounds incredibly lovely. I am on a huge evergreen bender. I want to smell it and smell like it ALL THE TIME. All the time. And cardamom is really on my radar lately. I love the flavor and the scent. The planter bowl is bee-autiful but that moth mug is everything. The dark green and gray striations are some of my fave colors and the Luna Moth always the symbol of the hills of Tennessee:) I'm envying your plants and sunshine, counting the days till Spring and less gloomy gray days here. Thanks! Luna moths are certainly magical aren't they? I saw one a few times in my life and I am left in awe each time. I hope spring arrives sooner than later, but this winter feels like it has dug its icicle formed talons into us and we can't shake loose. We have yet another cold front brushing over us this week.